Die PARTEI (English: The [Political] Party), formally Partei für Arbeit, Rechtstaat, Tierschutz, Elitenförderung und basisdemokratische Initiative (English: Party for Labour, Rule of Law, Animal Protection, Promotion of Elites and Grassroots Democratic Initiative), is a German political party that was founded in 2004 by the editors of the German satirical magazine Titanic. It is led by Martin Sonneborn. In the 2014 European Parliament election, the party won a seat, marking the first time that a satirical party has won a seat to the European Parliament. Partei für Arbeit, Rechtsstaat, Tierschutz, Elitenförderung und basisdemokratische Initiative ("Party for Labour, Rule of Law, Animal Protection, Promotion of Elites and Grassroot-Democratic Initiative") is a backronym for PARTEI, the German word for party. The phrase die Partei ("the party") is evocative of totalitarian parties—such as the SED (the former ruling party of East Germany) or the Nazi Party—and is thus a tongue-in-cheek reference to the ostensibly totalitarian ambitions of its founders. This is exploited and parodied in advertising in which the SED party hymn, Die Partei hat immer recht (English: The Party is always right) is played. Amongst other things, the PARTEI parodies existing parties' features and election tactics and its parody events sometimes include visiting other parties' events. Rebuild the Berlin Wall and the Iron Curtain between East and West Germany, changing east Germany into an "SBZ", a "Sonderbewirtschaftungszone" (Special Economic Zone). East Germany was referred to by the same acronym between 1945 and 1949 when it was called "Sowjetische Besatzungszone" (Soviet Occupation Zone). The aforementioned phrase was used to refer to the GDR for years afterwards, especially by right wing politicians who did not wish to acknowledge or recognize its existence. The government even issued a book called "SBZ von A bis Z" about things happening in the GDR. Discuss and ratify a new constitution by the people (per article 146 of the German Constitution). Sonneborn explains this as follows: "Better that we get those votes than some sort of neo-Nazis". In order to achieve its majority, the PARTEI is willing to form a coalition with any other party other than the Free Democratic Party because "We don't form coalitions with joke parties". Change the first article of the German Constitution ("Human dignity is inviolable") such that CEOs of certain TV channels would not possess human dignity. According to Die PARTEI, political goals are overrated; on the other hand, PARTEI promises a "modern" version of politics—i.e., they will ask for popular opinion and, once in power, will do something completely different. The PARTEI often caricatures the slogans of other political parties to emphasize how ridiculous some of them are. For example, "Hamburg – city in the North! ", "overcome contents" (Inhalte überwinden), "Education starts with 'E'" (Bildung fängt mit 'B' an) or "Youth crime – not with us!" 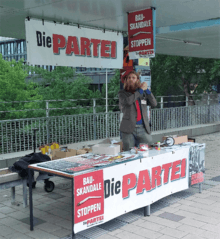 By using satirical ways of running a campaign or making politics, the PARTEI is also trying to point out what is going wrong in the established system. Titanic, whose employees would go on to populate the ranks of the PARTEI, began its political activities even before German reunification in 1990—it campaigned against it. As Titanic co-founder Chlodwig Poth explained, the magazine sought to parody the Bild newspaper's masthead, which read "The unity of our fatherland in freedom, that is our mission". Titanic has had the slogan "The definitive division of Germany – this is our mission" in its masthead since December 1989. The territory of the former GDR is thus to become a "Special Cultivation Zone" separated from the rest of Germany by edificial means in order to emphasize the visionary idea of such a zone and is to benefit from a de-bureaucratized and streamlined administrative system. Additionally, the PARTEI is demanding health care reform, protection of natural resources and a program for reduction of working time as an alternative to Agenda 2010, an unpopular set of labor market reforms introduced under Chancellor Schroeder in 2003. It also supports improved co-determination rights for citizens, in particular it demands that a new constitution be passed on the basis of wide-ranging discussions, to be ratified by the people (in line with article 146 of the constitution). The PARTEI was founded on August 2, 2004, by the editors of Titanic, a Frankfurt-based satirical magazine. The leadership of the PARTEI and the Titanic editorial team are close; former Titanic editor-in-chiefs include PARTEI chairman, Martin Sonneborn, and current honorary chairman, Oliver Maria Schmitt. Despite the fact that the PARTEI's official headquarters are located at Mauerstraße in Berlin, the fax number given turns out to be the same as that of Titanic editorial offices. Titanic is the official print organ of the PARTEI. Titanic has a history of participating in election campaigns. For the 2002 German federal election it set up a stand claiming to be the Free Democratic Party and shouted racist slogans. In January 2003, Titanic staff pretended to be candidates of the Social Democratic Party (SPD) in Hesse. For the 2003 elections in Bavaria it surrendered in the name of the Bavarian Social Democrats ("SPD: Wir geben auf"), who always lose to the Christian Social Union. The PARTEI has participated in three federal elections (2005, 2009, and 2013) and most state and municipal elections since 2005, achieving its best results in a few districts in Berlin and Hamburg without however doing well enough to gain any seats. In June 2005, the PARTEI joined forces with the Anarchist Pogo Party in an alliance called Zweckbündnis ("marriage of convenience") for the 2005 federal election. One campaign tactic was to auction its advertising times in German television (all German political parties are allotted TV time for campaign spots for free) on eBay. An allusion to a scandal of masked advertising on public television, the (mostly satirical) TV spots were presented in the corporate design of a German airline company. Nominating candidates only in the cities of Hamburg and Berlin, the PARTEI gained 10,379 votes (0.022% of all votes on national level). Die PARTEI, along with several other parties which had already participated in earlier federal and state election, was refused permission to take part in the 2009 federal elections. In July 2009 Roderich Egeler, Bundeswahlleiter (Federal Returning Officer) and president of the Federal Statistical Office of Germany, denied official party status and the approval for participation in the 2009 federal election. He criticised lack of seriousness and organisation within the party. He claimed his decision was based on a fax by Die PARTEI which expressed that there is just one single Landesverband (organisation in one of the states). Die PARTEI rejoined that no such fax existed and announced legal action. T-shirts saying "Where is my vote, Wahlleiter?" were sold as part of a protest campaign and the party demanded that Egeler resign after he did not revise his decision. On 13 August 2009, a movie called Die PARTEI – Der Film was released in theaters. On 3 November 2009 the party launched a challenge to the validity of the 2009 federal elections at the Bundestag. Die PARTEI also saw itself validated by Bundestag President Norbert Lammert's maiden speech in which he criticized the election registration process, because "representatives of the established parties decide whether or not to register the competition". The Organization for Security and Co-operation in Europe's report on Germany's 2009 elections suggested reforming election registration in order to allow unregistered parties to appeal before elections. On December 6, 2010, the party filed an official complaint with the Federal Constitutional Court. It was officially accepted in February 2011 but ultimately the court rejected it in April 2011 on the grounds that the party chairman as the complainant did not have the necessary right to complain. Die PARTEI garnered 0.17% of the votes cast in the state elections in Germany's largest state, North Rhine-Westphalia, on May 9, 2010. The candidate for the office of prime minister was forensic biologist Mark Benecke who was supported by several well-known artists. Many German-speaking celebrities are PARTEI members, some of whom participate as their candidates during election time, among them Rocko Schamoni, Heinz Strunk, Mark Benecke and the rappers Maxim and Nico from the Berlin Hip-Hop group K.I.Z. Rod Gonzáles, Hella von Sinnen, Dirk Bach and Guildo Horn all had their pictures taken with top-flight officials from the PARTEI to express their support during the 2010 state election. Die PARTEI participated in state elections in Berlin, Hamburg and Baden-Württemberg in 2011. In the 2011 Hamburg state elections held on 20 February 2011, Die PARTEI won 23,994 votes (0.7% of the total). In St. Pauli the party came in sixth place, winning 1,450 votes (4.9%), after SPD (37.4%), Greens (21.5%), The Left (20.1%), Pirate Party (6.7%) and CDU (5.8%). In five districts (Hammerbrook, St. Pauli, Sternschanze, Veddel and Kleiner Grasbrook) the PARTEI beat the well-established FDP. The PARTEI did best in the Kleiner Grasbrook district, where it attracted 39 votes, or 5.3%, drawing level in the district with Germany's largest party, the Christian Democratic Union (CDU). On September 22, 2013, Die Partei reached 0.2% of German voters in the 2013 federal election. In the May 2014 European Parliament election, the PARTEI managed to get elected to the European Parliament with 180,000 votes (0.6% of the total). Top candidate Sonneborn announced that all candidates from their list, starting with him, would take the seat for one month, then retire and thus get the most money out of the European Union. He also said he believed that they were "not the craziest party in the European Parliament". Its campaign slogan was "For Europe, Against Europe", which Sonneborn explained that the PARTEI was inclusive—it welcomed the 70% of Germans opinion polls said were not interested in Europe, "But we also say yes to Europe so everybody opposed to or in favour of Europe can vote for us." Specific campaign pledges included promising to "build a wall around Switzerland, put Chancellor Angela Merkel on a show trial in the Berlin Olympic stadium and to frack the rotund politicians Sigmar Gabriel and Peter Altmaier for cheap gas". Between 2005 and 2009 the PARTEI's student organizations began to make themselves felt in student parliaments in Bochum, Aachen, Berlin, Dortmund and Düsseldorf. In most cases the groups branded themselves as List for Grass-Roots Democratic Initiatives, Education, Animal Breeding and Promotion of Elites (German acronym LISTE -- Liste für basisdemokratische Initiative, Studium, Tierzucht und Elitenförderung). The student organization has 8,000 members nationwide according to its own reports. 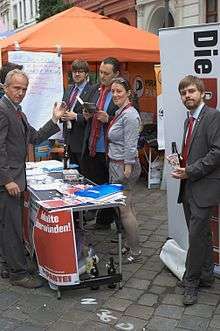 During the 2009/10 legislature the PARTEI student organization was able to advance its own man to the post of the President of the Düsseldorf student parliament. In the 2010/11 legislature the PARTY student organization now controls the post of assistant President of the student parliament at the Technische Hochschule Mittelhessen University of Applied Sciences, their LISTE standing for "List for Integration, Freedom from university fees, Technology and Promotion of Elites"). On April 20, 2011, Tobias M. Bölz, chairman of LISTE at the Karlsruhe Institute of Technology was elected to the chairmanship of the executive committee of the student body, having been president of the student parliament in the previous legislative period. In line with the motto, "We need a children’s and youth wing, because we need a children’s and youth wing! ", the Hintner Youth, named after the PARTEI's general secretary Thomas Hintner, was founded on June 5, 2005, during the state conference in Mannheim. The Hintner Youth's official greeting is, "Hi Hintner! ", thus alluding to the Nazi Party's Hitler Youth and greeting. The Hintner Youth's uniform, with its blue shirt, gray trousers and red scarf are reminiscent of East Germany's Pioneer Organization and the Free German Youth (FDJ). The Hintner Youth organizes an annual summer camp at the Helmut Kohl memorial camp site near Waldhambach as well as a number of other events, among them climbing the Watzmann in the name of, "heaping up the summit to get up to at least 3,001 meters". The PARTEI runs a school in Schwerin, which by allusion to the official SED schools is simply known as the "PARTEI school". The school's purpose is not only to improve PARTEI official's political literacy but also to provide general educational programs, including IT and foreign languages. The school's director is Heike Zeilinger, with Ulf Mittelstädt and Michael Padefke as heads of the individual departments. According to the PARTEI the school has no real estate of its own. ↑ Sonneborn, Martin (2009). Das PARTEI-Buch Wie man in Deutschland eine Partei gründet und die Macht übernimmt. Köln: Kipenheuer & Witsch. ISBN 978-3-462-04090-6. ↑ Kotte, Hans-Hermann (2009-02-28). ""Verfassungsfeindliche Plattform": Bitte bespitzelt uns!" ["Anti-constitutional Platform": Please spy on us!]. Frankfurter Rundschau (in German). Retrieved 2014-09-15. ↑ ""Die Partei" ist einmarschiert" ["The Party" has invaded]. Volksblatt.li (in German). 2009-05-21. Retrieved 2014-09-15. ↑ Schiller, Maike (2008-02-19). "Politik ist, wenn man's trotzdem macht". Hamburger Abendblatt (in German). Retrieved 2014-09-15. ↑ "Eklat im Bundeswahlausschuss" [Scandal at the Federal Election Committee]. derStandard.at (in German). 2009-08-06. Retrieved 2014-09-15. ↑ "Photo collection with German celebrities and PARTEI members"
↑ "Official statistics of Hamburg elections"
1 2 3 Crossland, David (22 October 2014). "Satirist lives the dream on EU gravy train". The Local. ↑ "Ex-Titanic-Chef Sonneborn ins EU-Parlament gewählt", Der Tagesspiegel, 26 May 2014.